Lunch For $5 Or $10! 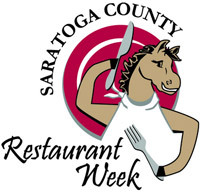 Participating local restaurants offer 3-course dinner specials during the Saratoga County Restaurant Week. Start off with your choice of an appetizer or salad, then choose from a menu of sumptuous entrees, and top it off with a decadent dessert! Plus some participating restaurants are offering lunch specials for just $5 or $10. Saratoga Restaurant Week is the perfect time to get out and try new restaurants in the Spa City!